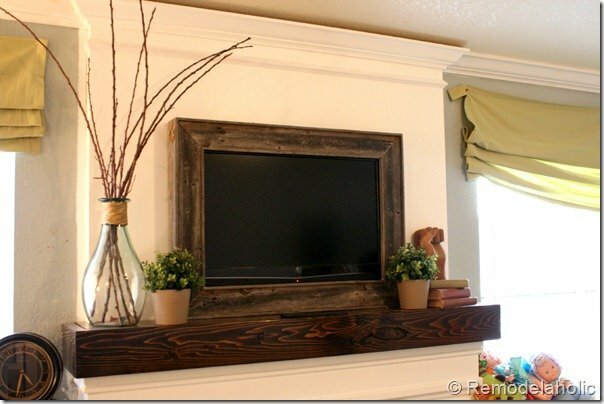 DIY TV Frame: Disguise Your TV! Most of us have faced the dilemma of what to do about the all important TV when we are decorating our home. It’s not an easy thing to get past as a designer… some designers won’t even allow them in their design unless they are fully enclosed and hidden! We know you and your family live in the real world, however… and if you are like me, you want to have easy access to your TV, or have it available for the kids without some big production. Oh, and did I mention those “cabinets” that can fit a large flat screen TV’s are expensive? 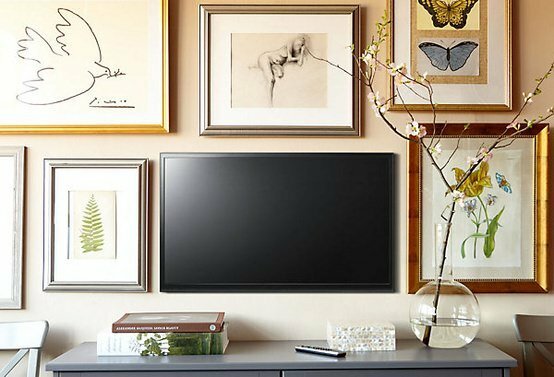 Learn these tips, tricks and projects on how to frame your TV! 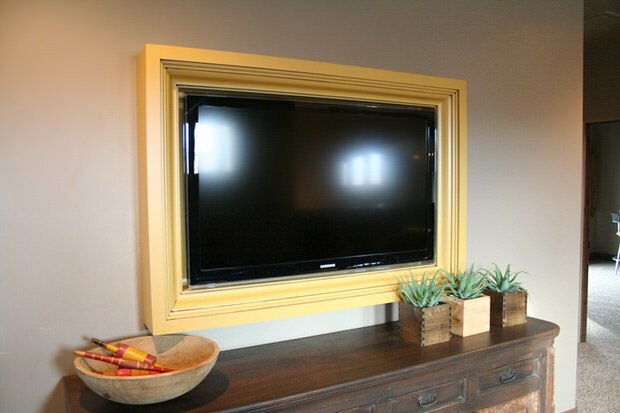 At our recent city wide Parade of Homes, several builders were utilizing a great idea to frame your TV, and it can be done DIY! 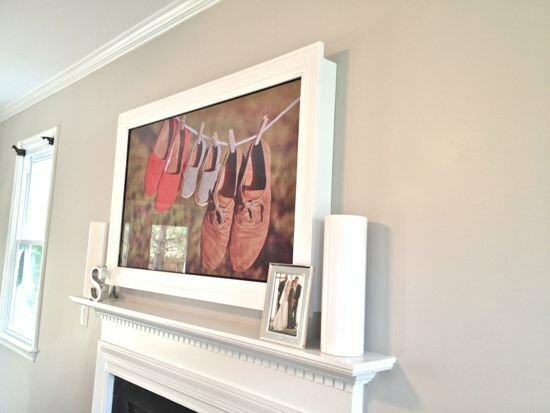 Our friends at ‘Remodelaholic‘ have a great tutorial for you on how to frame a TV on the wall. This takes just simple power tools and basic carpentry skills…. They chose re-purposed wood for theirs, and we love this! This look would look great in almost any style home, from industrial chic to Pottery Barn traditional. Feel free to choose whatever framing material fits your style and budget. 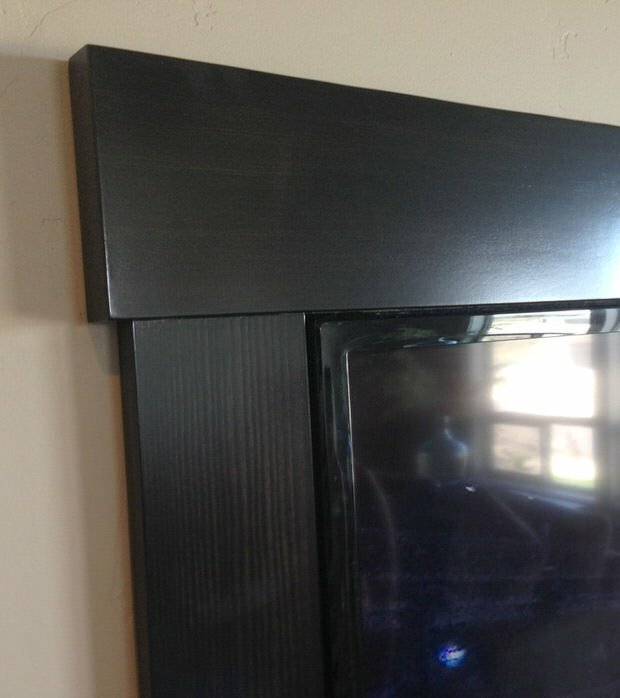 Check out their DIY TV Frame Tutorial. 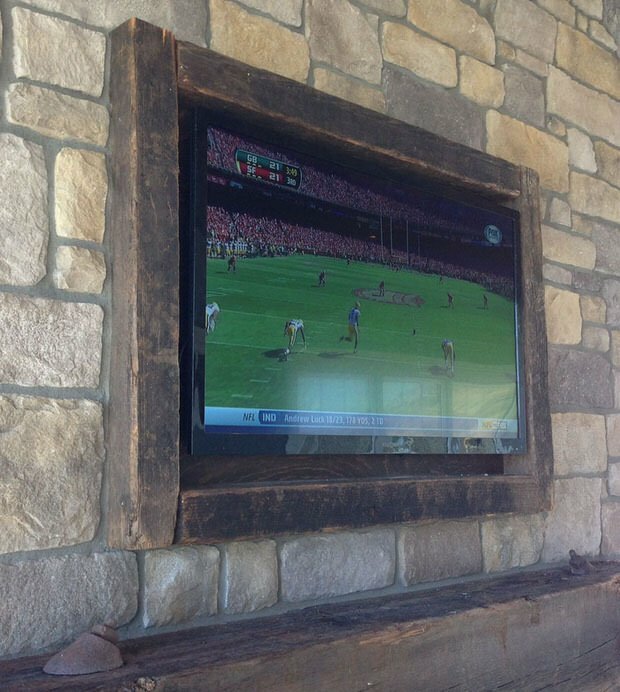 Here are more ideas for building a frame around the TV. This is a gold tone frame from ‘Aspenmill‘ thats goes perfectly with the style of the room. At first glance, I actually thought it was art! Or this traditional wood TV frame from ‘Frame My TV‘! This white TV frame has more of a cottage style going for it. 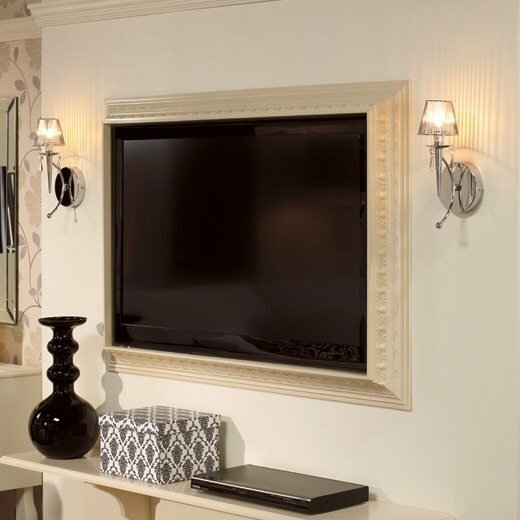 Are you getting a feel fro how you can match the style of the TV frame to the style of your room? From ‘Rona‘. ‘Bringing Art Back to Interiors‘ has a more contemporary version of a white TV frame. It blends really well with all the whitewashed brick and the white woodwork in the room. 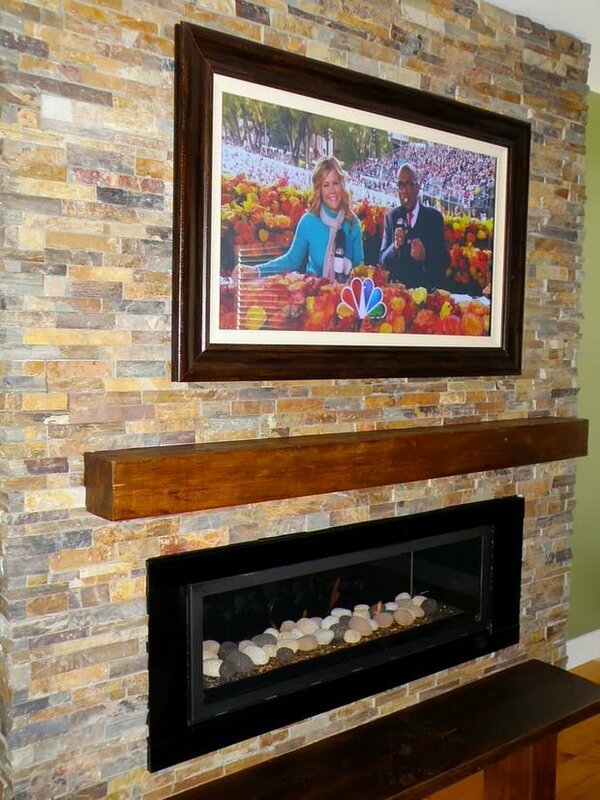 And if building a frame isn’t in your skill set, we have some more great ideas for disguising the TV! 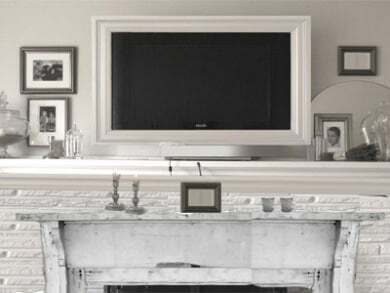 This great TV frame idea comes from ‘Real Living‘ magazine. 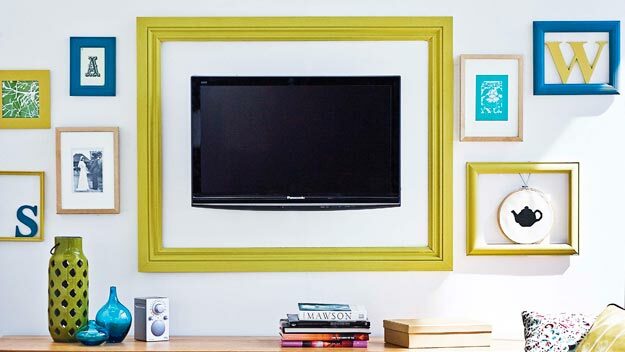 A simple painted frame and other artwork takes the emphasis off the Tv and makes it fun and fresh! This is a great example of turning the TV into art! Notice how the color of the frame around the TV ties in with the other artwork? From ‘One Kings Lane‘. Another example, unknown source. This white frame softens the edge of the TV so there isn’t just this black hole on the pretty graphic wallpaper. And ‘BHG‘ hides the TV by using it as part of a gallery wall. It becomes a part of the grouping. The black frames and B&W art help the TV to fade into the wall display. Ok, so now that you have all these great idea on how to build a DIY TV Frame, check out our post on Hide The Ugly – Outdoor Eyesores, and Hide The Ugly – Indoor Eyesores! Remember roller blinds. You pulled then down or a light tug would lift them up. So mount a blind behind a deep frame. If you are artistic paint an abstract or scene on the blind so when it’s down you have art. Blow up a family picture and decopodge it to the canvas like roller blind. A shadow box type frame would accommodate the depth of the blind. I can think of several things that would be easy to attach to the blind: fabric, stenciled letters old prints. Just an FYI. As for the heat factor; cut 1/4 inch slits in the top and sides of the frame, with larger openings at the top to vent. If there is a mantelpiece it will help block direct heat. Also call the manufacturer for information just to make sure. We want to put our tv above the fireplace but everything I read says No ! The heat can ruin your tv. Does anyone know differently? Great look but not enough ventilation for the TV’s. Possibly a fire hazard of the TV’s get too hot and at the very least, shortening the life of the TV hot components=shorter life. There is a lot of controversy about this it seems, thx for your opinion! I absolutely love this framing idea and had the idea when I got my 55′ flat screen. However I didn’t know how to implement it because of all the cords. My tv is over the fireplace but the cords come from an 8 ft tall cubicle that was meant for a tv, receiver, DVD Player etc. If I missed this info in a tutorial I apologize. HELP! I love the idea of being able to sort of hide the TV, but I don’t think this would work for our set up. We have all sorts of cables and wires running from the TV to the receiver, a computer tower, an Xbox, a stereo, and the surround sound. Maybe someday, but We’re also thinking of upgrading to a projector and nixing the TV altogether. Loew’s and Home Depot both carry smurf tubes also known as carlon conduit. We have all cords, cables and wires fed from the tv through one of these blue tubes which we fed down behind our drywall to where the equipment is installed. It took a little bit of time, but certainly no expertise to install this. It’s so nice not to have those cords on display. My TV have buttons on the side for volume, channel, ect. I love this idea but how would I access those controls if I frame it in? You got a remote? I never use the buttons on my TV. If I lost my remote, I’d have to get another TV!!!!!!! Many phones now double as remotes and are even better because they show guides, etc. I always use my phone as my remote now. Some of these are “cute” but um…NO! A TV is supposed to be a TV. I have seen many beautiful living rooms that have there TV on an entertainment center or mounted on a wall without a frame. A frame for a TV? Are you kidding me? Hahaha…well….hahahaha! I just can’t. I just cannot comment anymore. I do too. During gatherings I stream famous artwork and images that make a TV look like it belongs in the wall. LED TVs aren’t going to overheat with the right materials and air flow. Each to his own taste. Everyone uses their TV how they want in their own home. It’s odd that another’s decor choice would cause such concern. You work with what you have and the style you want. I agree with Brit, I’d be afraid of my TV overheating. A few holes here and there probably won’t do it. Very nice looking but I hate to be the Debby downer that reminds people there is a reason why TVs aren’t sold this way. They need ventilation! Mounting your TV in such a way risks overheating the television and probably will cut short the life span of your TV if nothing else. LED TVs seems to emit less heat than LCDs, but still. Doing this may even void your manufacturer’s warranty, I suspect. A lot of the tutorials talk about how to add ventilation – cutting holes etc…. Also, as you said, Most of the newer TV’s are LED which are much better for this sort of installation. You are 100% wrong. Your t.v. will not overheat due to a frame. The frames are not air tight as well as the fact that flat panel t.v.’s don’t emit enough heat to over heat. Not to mention some of these frames don’t enclose the screen at all. How about some ideas for double brick homes especially hiding all the cables. Maybe an idea for the teens in the house who also use the main tv to view and play games. I would like to hide a 55″ flat panel TV within a picture frame located in our Living Room. To cover the TV screen when not in use I was thinking of putting a canvas painting or print over the screen within the frame. When I wanted to use the T V the canvas picture would roll up into the frame leaving the T V screen for all to see. When not in use the picture would roll down and cover the screen thus keeping the ambiance of the living room in tact. Are their such products that could accomplish this concept? Not that we know of – sounds like a great DIY project! Maybe start with a roller blind where an little pull down rolls it up, like the maps at school many years ago. Try a roller shade. You can actually paint them or take the shade off and attach a painting done on canvas. Saw this many years ago in a magazine, but never actually tried it myself. Would be interested to know if it works and how it looks. Great idea! Yes, totally a DIY project! My place is nautical themed and that would be perfect! Look at Leonspeakers.com. They make custom frames with an electric shade that rools up to the inside top of the frame when you watch the television. These are beautufil, but obviously not video systems belonging to videophiles for whom the goal is to remove any distraction from the viewing experience. My flat panel tv sits in front of a very dark purple wall w/ no visual ‘noise’ around it for an undisturbed viewing experience – when the lights are out and the feature is playing you only see the tv! I’m sure the two seemingly divergent focuses could come together by using dark-hued artistic notes. Where are all the cords and cables at to the tv in these posts? Behind the TVs and feed into the wall. Yes I know, not an easy task! What is Kombucha Tea? Should You Be Drinking It?